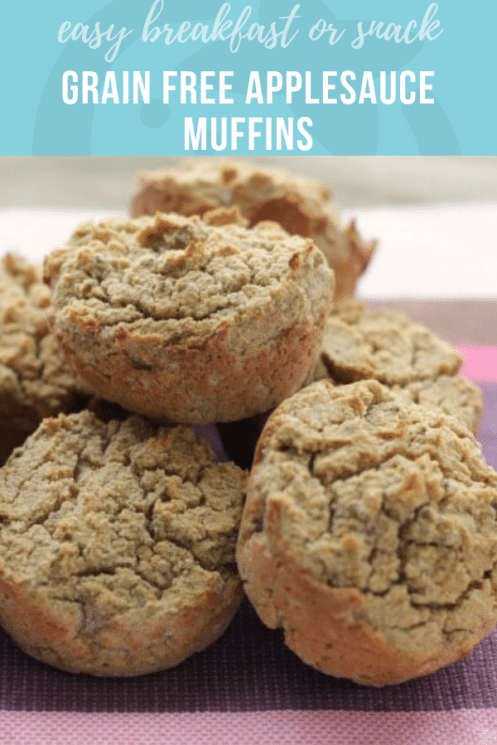 Experimenting with grain-free baking is such a fun challenge and I’m delighted to share these Grain-Free Applesauce Muffins with you and your families today. They mix up really quickly in a food processor and bake up in less than 30 minutes. Plus, they store well in the fridge for days and retain their moisture well. In short, they are a great breakfast or snack option to have on hand during the week! During my recent pregnancy, my hormones made eating my normal diet rich with whole grains a challenge. 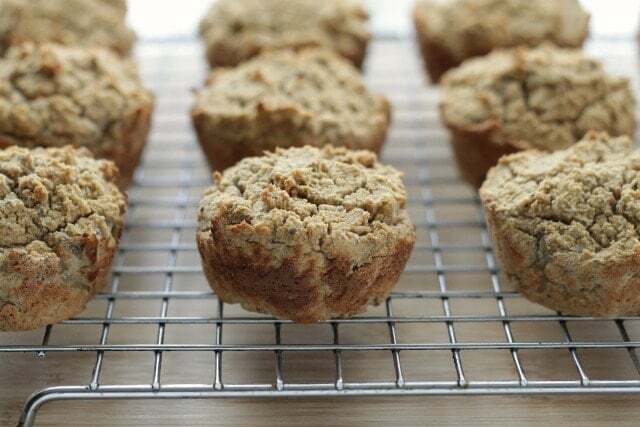 I started exploring grain-free options and started baking with buckwheat and coconut flours to ensure that I was getting complex carbohydrates—and to make sure that I had easy snacks on hand for when I was suddenly starving. 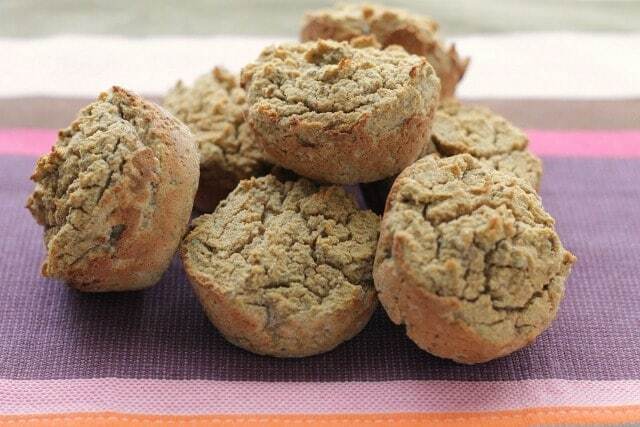 These muffins, which also happen to be high in protein and fiber, became a weekly staple. I love how the flavors of the applesauce and cinnamon mix together and that these are equally delicious slightly warmed and cold straight out of the oven. My 3 year old likes them with a little almond butter on top, which is a really good option if your little ones can eat nuts. If you are new to baking with coconut flour, know that the batter will be thick, yet pliable, so you can smooth and shape the top of each muffin as you fill the muffin tin. Coconut flour also absorbs a lot of liquid, but the finished product is somehow still super moist, especially after sitting in the fridge. In short, these are a really good option if you or someone in your house needs to eat gluten-free or grain-free. I hope they satisfy your appetite as much as they did mine! Preheat oven to 350 degrees F and grease a muffin tin. Place all ingredients into a food processor and blend until smooth, scraping down the sides as needed, for about 30 seconds. Fill muffin cups about 3/4 full. Smooth tops. Bake for 30-32 minutes or until a cake tester inserted into the center comes out cleanly and the edges are golden. Remove from oven and let cool slightly in the pan. Use a paring knife to loosen edges and cool completely on a wire rack. Store for up to 5 days in an airtight container in the refrigerator. 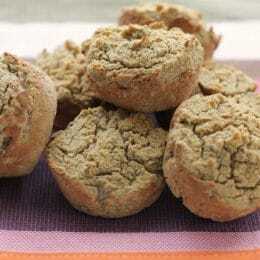 Coconut flour is quite dry, so it’s possible that a variation in the type of applesauce could cause the muffins to be dry. 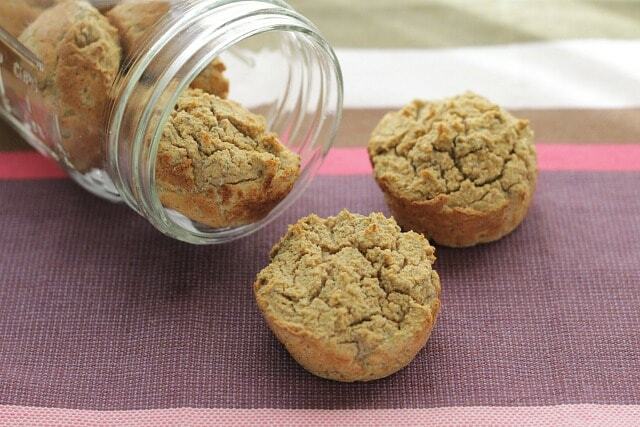 You could try spreading applesauce on top of a halved muffin to add some moisture in while eating! What can you sub coconut sugar for? Great recipe, although agree with the coconut flour being really dry, so maybe using less and adding a bit more of the apple sauce mixture. thanks for sharing.